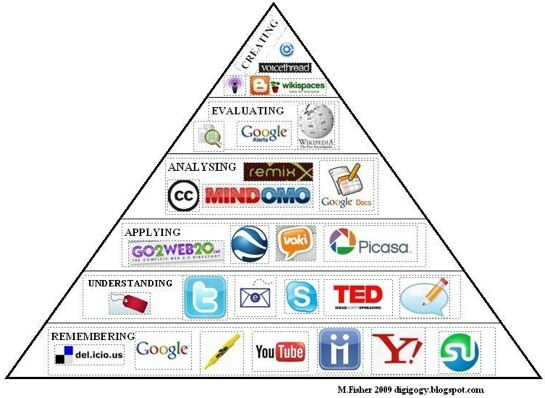 What technology tools have you used? How were these tools used? Did this work for you as a learner? Why or why not? What principles of learning might have been considered more carefully? Why? Clickers - Student Response Systems or simply "Clickers" are wireless handheld devices that allow students to respond to classroom polls and quizzes, regardless of class size. Explore deeper with the Clicker Toolkit. ePortfolios - are online collections of your work that allow you and your students to demonstrate your skills and interests to diverse audiences. Highly customizable, e-portfolios allow you to assemble subsets of your work to present to instructors, potential employers and others via login. Explore deeper with the ePortfolio Toolkit. LMS - Learning Management System - is an information system that allows you to present a wide variety of instructional materials (text, audio, video, etc. ), interact with students, facilitate peer-to-peer interaction and manage grades, all within a secure environment. UBC is moving from WebCT Vista to Blackboard, More about the LMS project. Other LMS tools include, Sakai, Moodle. Wimba Classroom - is a web-based meeting tool that allows you to teach classes online in real-time. Features include chat, audio, video, content display, application sharing, whiteboard and polling. Wimba Classroom can be used inside and outside WebCT Vista. Explore deeper with the Wimba Classroom Toolkit. Note that UBC is moving from Wimba Classroom to Blackboard Collaborate. RSS - is a family of web feed formats used to publish frequently updated content such as blog entries, news headlines and podcasts in a standardized format. A RSS document, called a web feed, contains either a summary of content from an associated website or the full text. RSS makes it possible for people to keep up with websites in an automated manner. Audio/Video Tools - these tools, and other digital collections and resources, are increasingly engaging, timely and relevant ways to deliver and/or supplement course content. Just a few examples: Rap Guide to Evolution ; Regulatin' Genes YouTube video ; DNA Replication YouTube video Explore our Video Basics Toolkit. Simulations - programs that imitate real life phenomena, systems or environments. A few examples: Virtual Biology Labs (Rutgers); Virtual Soils Processes Project Phet: Physical Science Simulations: University of Colorado. Electronic Collections - UBC Library subscribes to many databases that link to the scientific literature. Some examples are: BIOSIS Previews, SciFinder Scholar, Web of Science and Zoological Record. Student Toolkits: CTLT has pulled together a collection of resources for students that may help them with their projects where they are selecting and using particular technologies to present their work. This is an attempt to offer a thumbnail view of the current thinking around the principles that may help to explain how learning happens and how it can be supported. For the detail relevant to each one of these principles, please dig into the resources/references provided below the table. Frequent student-faculty contact in and out of class is a most important factor in student motivation and involvement. Approaches that support contact between faculty and students are important. To develop mastery, students must acquire component skills, practice integrating them, and know when to apply what they have learned. Experts differ from novices in terms of how they approach problems and relate, integrate, synthesize and organize pre-existing knowledge to propose solutions. Learners benefit with the opportunity to apply problem analysis and solutions in many varied contexts (including real-world problems and simulations) Foundational knowledge provides the basic understanding that is necessary for other kinds of learning. Learning is a product of working memory allocation. Working memory has constraints in terms of how much information can be retained at one time (about 4 things) and how much can be attended to (fully) at one time (1 thing). Working with others often increases involvement in learning. Sharing one’s ideas and responding to others’ improves thinking and deepens understanding. How students organize knowledge influences how they learn and apply what they know. Understanding vs. memorization. Students who organize their facts around general principles or concepts are moving in the direction of the organizational principles used by experts and can be broadly applied to many different problems. Integration is the act of making connections and gives learners a new form of power - especially intellectual power. Learning is not a spectator sport. When students talk about what they are learning, write reflectively about it, relate it to past experiences, and apply it to their daily lives it becomes integrated as part of themselves. Students' prior learning can help or hinder learning. Previous experience, prior knowledge can support or hinder learning - depending on a students degree of flexibility at integrating new conceptual information. Application learning allows other kinds of learning to become useful. Working memory's capacity for allocation is affected by prior knowledge. The more one knows about something (if it has a sufficient degree of accuracy and if it can be retrieved when needed), the easier it is to learn something new about it. Knowing what you know and don’t know focuses your learning. Effective learning requires assessment of existing knowledge and competence and frequent opportunities to perform and receive feedback. To become self-directed learners, students must learn to monitor and adjust their approaches to learning. Learners who actively monitor their own learning strategies and resources and adjust accordingly, transfer learning more successfully. Learning how to learn enables students to continue to learn, across contexts and with greater effectiveness. The focus may be as broad as learning how to take notes in a way that highlights connections between concepts or as specific as pursuing a particular line of inquiry in a certain discipline. Time plus energy equals learning. Goal-directed practice coupled with targeted feedback enhances the quality of students' learning. Time to learn. Beyond "time on task" students need to see the transferability of the principles that they are learning about. They need time to process and develop understanding. Working memory stores in long term memory when there is attention, repetition, connection between concepts and experience and chunking of information. Expect more and you will get it. Students' motivation determines, directs and sustains what they do to learn. Motivation is central to learning. Factors affecting motivation include expectations of success, perceived value of the task (real-world relevance) and level of difficulty. Energy for learning is required for significant change. When students care about something, they have the energy they need for learning more about it and making it part of their lives. Working memory allocation is directed by motivation. Attention requires effort and motivation impels and sustains us in putting forward the effort required to attend to and learn something. Many roads lead to learning. Different students bring different talents and styles. Students need opportunities to show their talents and learn in ways that work for them. Students' current level of development interacts with the social, emotional, and intellectual climate of the course to impact learning. Transfer of learning is an active, dynamic process. It requires learners to actively choose and evaluate strategies, consider resources, and receive feedback. The human dimension informs students about the significance of what they are learning. Learning experiences can change the way students care about something. When students learn something important about themselves or others, it enables them to function and interact more effectively. Note: Researchers in the area of educational technology are exploring current and relevant notions around learning principles related to sensemaking and wayfinding. See additional resources for more on this. Eberly Centre for Teaching Excellence: Carnegie Mellon University. Research "distillery" and teaching support unit for How Learning Works: 7 Research-Based Principles for Smart Teaching. George Siemen's work related to sensemaking and wayfinding: relevant considerations when working with learners in informationally rich and complex environments. Course context You are a faculty member teaching a fourth year laboratory course in which students will design and run an experiment. There are 60 students divided into 3 sections with 20 students each. The course runs for 12 weeks but you only see the students for 3 hours every other week. You have one TA. Demonstrate the experimental methodology to their peers. Read a scientific article and communicate the findings to the class. Write a short grant proposal describing the experiment and why the study should be funded. Select one course objective listed above. Create an activity to support the learning objective. Select a technology or technologies to support the activity. The S E C T I O N S framework can be used to facilitate decisions with regard to choice of technology at both the strategic and the tactical level. Frameworks like this one are helpful to decision making in that they provide an objective lens through which to review the technologies you are considering. Consideration of your teaching goals and learning objectives will also provide a useful lens. Without a framework or clear idea about your goals, it is easy to be captivated by the latest tool or platform. This model is taken from the book Effective Teaching With Technology in Higher Education: Foundations for Success. by Tony Bates and Gary Poole (2003). We have adapted a set of questions and planning guide (using this framework) that better reflect teaching considerations. This page was last edited on 11 September 2018, at 16:57.